Leiomyoma is a benign tumor of the uterine smooth muscle that occurs in approximately half of all women by the age of 50 years. However, these tumors occasionally occur in other parts of the body. A 27-year-old woman presented with a painless, slow-growing nodule on her right index finger that had increased in size to 1.6 cm × 1.4 cm × 1.2 cm. 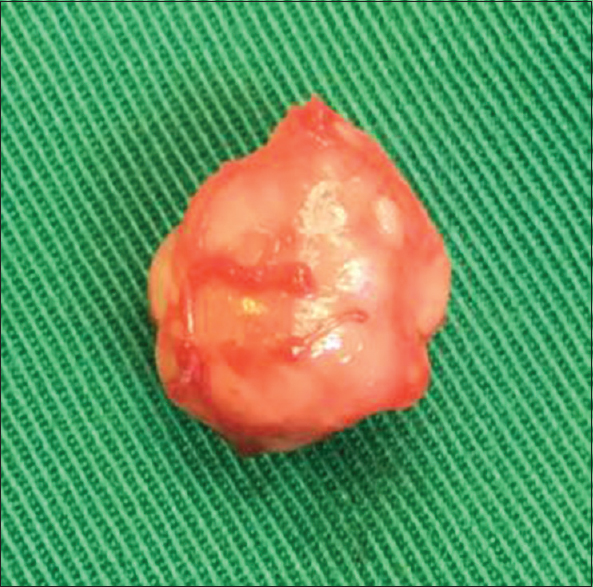 The initial diagnostic hypotheses included a ganglionic cyst and giant cell tumor. However, surgical excision and histological analysis revealed this tumor to be a leiomyoma of the hand. A leiomyoma, or fibroid, is a benign tumor of smooth muscle tissue that rarely undergoes malignant transformation. Although these tumors may develop in any smooth muscle tissue within the body, they occur frequently in the female reproductive system and rarely on the extremities. Vascular leiomyomas of the limbs occur in the lower extremities in approximately 70% of cases and are twice as common in women than in men. However, leiomyomas of the head, neck, and upper extremities are more common among men. Vascular leiomyomas of the hand are rare, accounting for 17% of all such lesions. These tumors are usually solitary, skin colored, well defined, and smaller than 4 cm and are often painful to palpate. A 27-year-old woman visited the clinic 6 months ago with a painless, progressively enlarging mass on her right index finger [Figure 1]. The tumor appeared as a well-defined, freely movable mass with a soft consistency and no associated sensory impairment. The lesion was located at the volar aspect of the proximal index finger and measured 1.6 cm × 1.4 cm × 1.2 cm. The patient had no history of trauma or family history of nodules in the hands. The tumor was excised under conscious sedation and a nerve block after the administration of preoperative antibiotics [Figure 2]. A tourniquet was inflated for a total of 60 min. The first finger of the right hand was accessed with a Bruner incision to expose the mass, which was dissected to release it from its attachment while meticulously preserving the digital nerves. 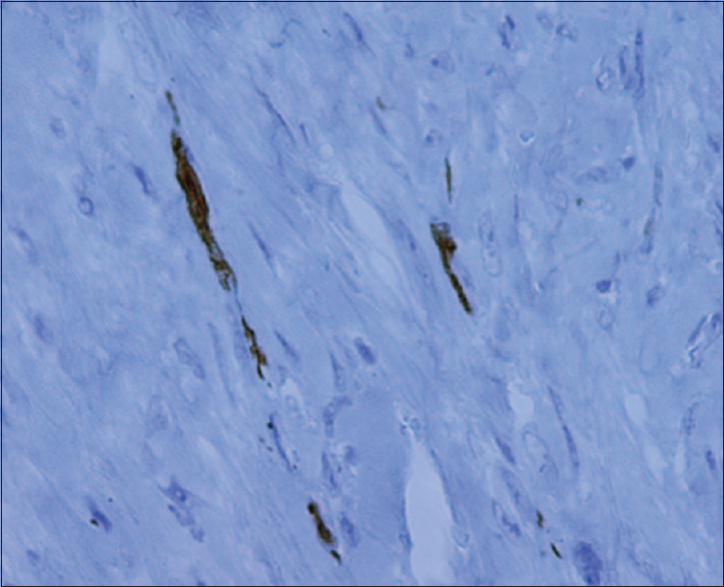 The excised tissue was submitted for histopathologic analysis. At the time of the most recent postoperative visit, the patient's scar had healed, and she had retained her range of motion. Histopathologic analysis revealed sections of well-circumscribed solid growth that had formed nodules composed of spindle cell fascicles with unexceptional nuclei and no increase in mitotic activity. Compressed blood vessels were visible on the periphery and within the tumor. No evidence of atypia, necrosis, or malignancy was observed. The tumor cells were positive for vimentin [Figure 3] and negative for desmin [Figure 4]. Leiomyomas can grow wherever smooth muscle is found. These slow-growing, solitary tumors are extremely infrequent but tend to enlarge to enormous sizes. However, leiomyoma rarely occurs in the upper extremities, especially in the hand, because these areas contain a minimal amount of smooth muscle. In most reported cases, leiomyoma of the hand occurs between the third and fifth decades of life. Our patient was an otherwise healthy woman in her 20s who developed a normal lesion at an unusual location. Three types of leiomyoma have been identified: vascular, which arises from the smooth muscles of veins; cutaneous, which originates from the arrector pili muscles; and deep soft tissue. Many researchers claim that the most common type of leiomyoma arises from the venous tunica media layer, and most such lesions in the hand are of the vascular type. The general vascular type can be further divided into capillary, solid, venous, and cavernous lesions. The etiologic mechanism of a leiomyoma of soft tissue is not clearly understood. These tumors are generally attributed to hormonal changes associated with estrogen, venous stasis, and previous trauma. Pain and tenderness, which may be minor (e.g., tingling) or intense, is the only clinical manifestation in approximately 80% of all cases. These sensations may appear spontaneously or in response to cold, touch, pressure, or stress. Although most authors claim that pain is progressive, our patient did not initially experience discomfort. The evidence suggests that pain sensed by the affected patient is caused by contact of the peripheral nerve fibers with the tumor itself or by contracture of the tumor smooth muscle, resulting in ischemia. Magnetic resonance imaging (MRI) is the preferred method of leiomyoma assessment because it accurately demonstrates the nature of the lesion. However, differentiation between benign and malignant lesions is difficult. The lesion described in this report exhibited high signal intensity on T2-weighted MRI and iso-signal intensity during the delayed phase on T1-weighted MRI with peripheral enhancement [Figure 5]. 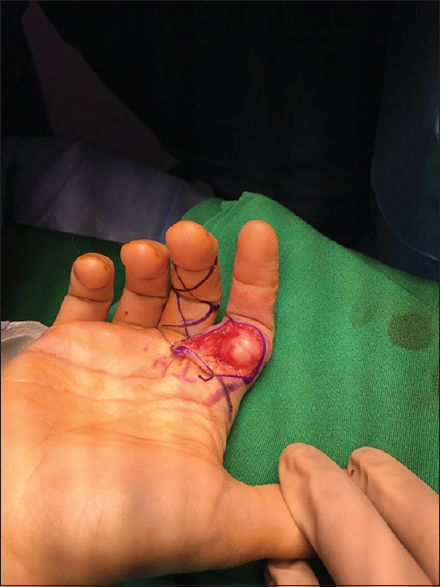 The images reveal that the lesion abutted the adjacent flexor tendon and was separated from the underlying bony cortex and the flexor tendons of the index finger. 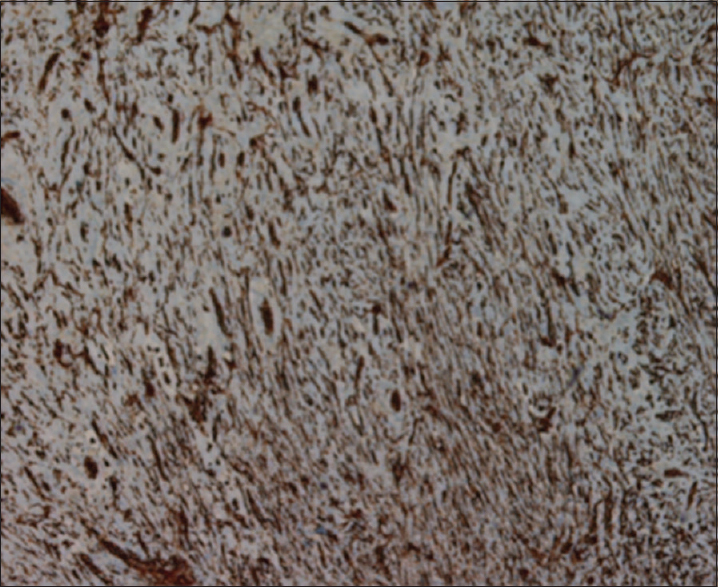 A normal cortical outline and signal intensity were observed in the bone marrow. No other subcutaneous lesion, joint abnormalities, or effusion was identified. 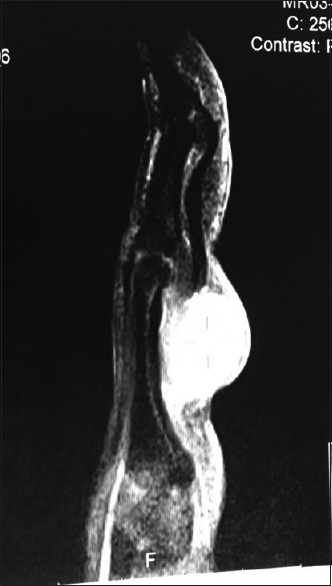 An ultrasound scan also demonstrated a well-defined soft-tissue mass measuring 1.45 cm × 0.86 cm × 1.25 cm within the volar and radial aspects of the right index finger. Many types of nodules, most benign, have been reported in the hand and wrist. In this case, the initial differential diagnosis of the observed nodule included a ganglionic cyst and giant cell tumor, which are the most common types of palpable nodules of the hand. Leiomyoma of the hand is typically treated via simple surgical excision and ligation of the underlying vessels, and the postoperative recurrence rate is low. Additional treatment is not required because the cells lack mitotic activity. Circulation must be assessed preoperatively because most lesions encompass the adjacent vessels. Leiomyoma of the hand is a rare type of smooth muscle tumor. This lesion should be considered when a patient presents with a slow-growing and painful nodule. Preoperative MRI is important to determine the extent of the mass and its relationships with the surrounding neurovascular structures and underlying bones. However, an accurate diagnosis requires surgical excision. Kulkarni AR, Haase SC, Chung KC. Leiomyoma of the hand. Hand (N Y) 2009;4:145-9. Cigna E, Maruccia M, Malzone G, Malpassini F, Soda G, Drudi FM, et al. A large vascular leiomyoma of the leg. J Ultrasound 2012;15:121-3. Moritomo H, Murase T, Ebara R, Yoshikawa H. Massive vascular leiomyoma of the hand. Scand J Plast Reconstr Surg Hand Surg 2003;37:125-7. Enzinger FM, Weiss SW. Benign tumors of smooth muscle. In: Weiss SW, Goldblum JR, editors. Soft Tissue Tumors. 4th ed. St. Louis: CV Mosby; 1995. p. 467-90. Boyd R, Bhatt B, Mandell G, Saxe A. Leiomyoma of the hand: A case report and review of the literature. J Hand Surg Am 1995;20:24-6. Hachisuga T, Hashimoto H, Enjoji M. Angioleiomyoma. A clinicopathologic reappraisal of 562 cases. Cancer 1984;54:126-30. Boutayeb F, El Ibrahimi A, Chraibi F, Znati K. Leiomyoma in an index finger: Report of case and review of literature. Hand (N Y) 2008;3:210-1. Yang WE, Hsueh S, Chen CH, Lee ZL, Chen WJ. Leiomyoma of the hand mimicking a pearl ganglion. Chang Gung Med J 2004;27:134-7.